Ahh, today is one of those days where I shouldn't be polishing, lol. Even my cleanups aren't going as it should, managed to ruin a mani with that earlier, yikes! 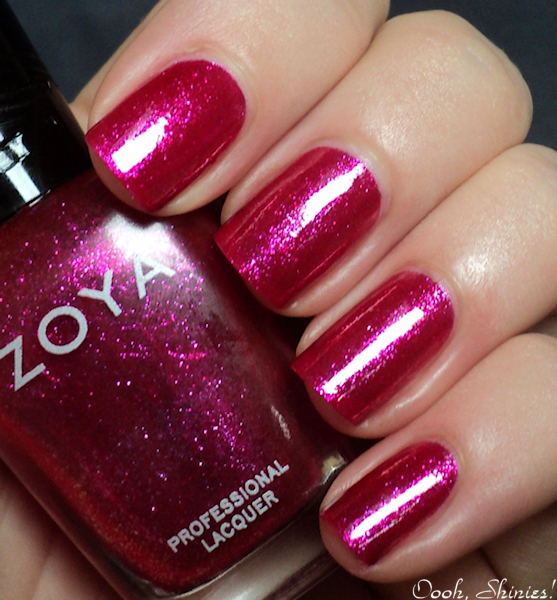 So after some failed manicures I present to you, 2 coats of Zoya Alegra with top coat. 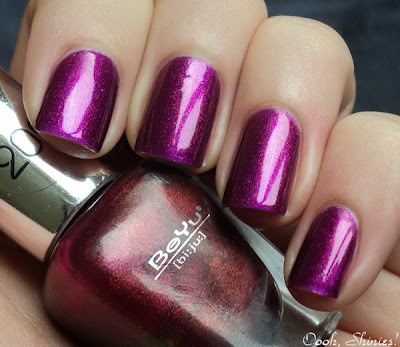 Alegra is a gorgeous dark magenta kinda color, and it's also one of my favorite pedi polishes. I haven't used it as mani in a while, but I love it! One of the few bottles that's really going empty :) The VNL isn't visible irl, my camera just has a hard time with this pretty. Thanks to the lovely Deborah I got a bottle of BeYu 209, which is the little sister of Clarins 230 aka Unicorn Pee! Last night I wanted to use it in a layered mani and chose China Glaze Senorita Bonita as base (you can see my swatches of SB here). 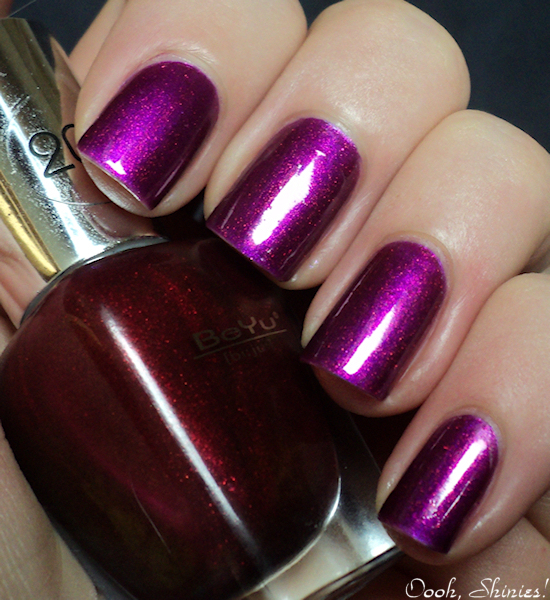 I used 3 coats of that, and as soon as I applied BeYu 209 to one of my nails, I went OMG. What a pretty result! 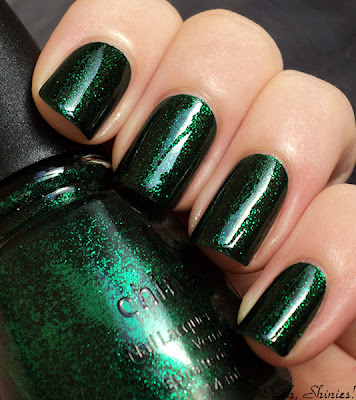 The flecks in SB come through and 209 adds a gorgeous shimmer. 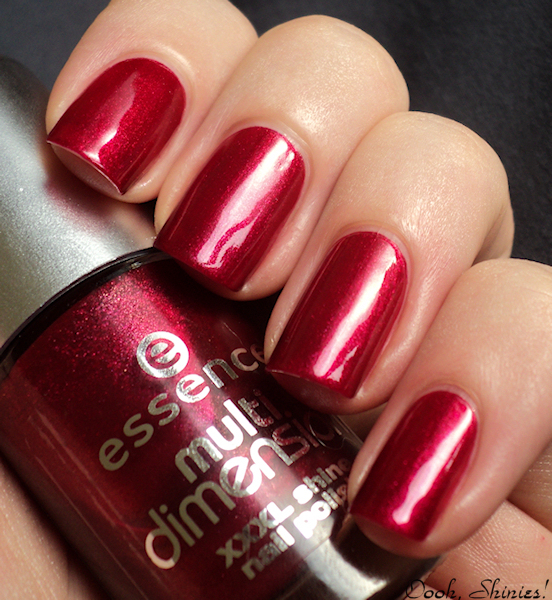 This combo shifts from bright magenta to purple to more red. Unfortunately I can't find the green/blue that shows in the bottle of 209 on my nails with this combo, but I'm loving it nevertheless! 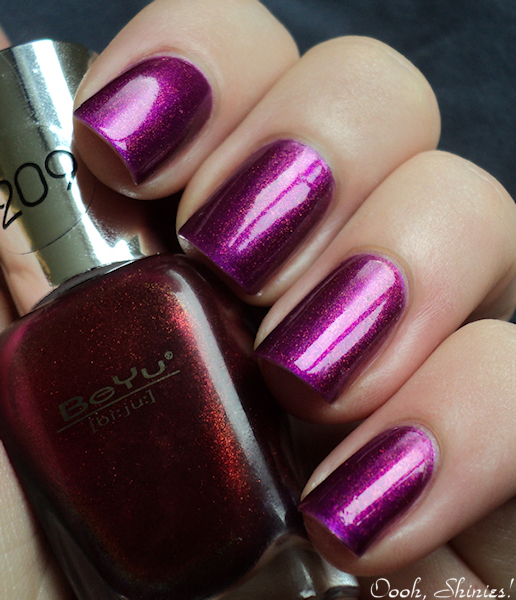 I first heard of BeYu 209 from Miss Enabler Jeanette, who explains more about 209 and it's dull version in this post. I used 2 coats of Essence Fall For Me, added a French with Essence Replay, dotted white with Essence Perfectly True and yellow with Orly Spark. 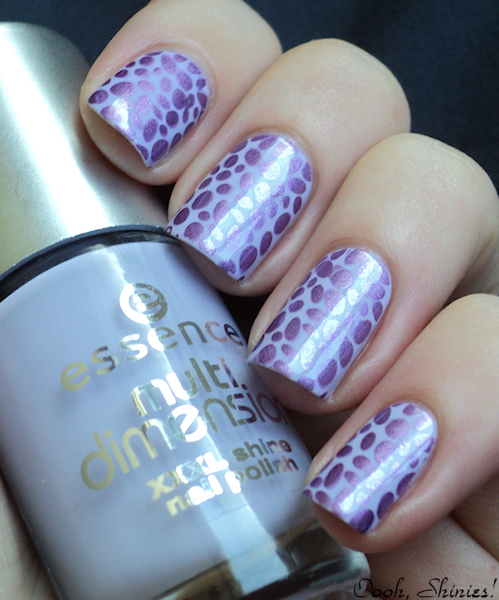 I also used the Essence Express Dry Drops on my top coat again, and this time it worked great! I thought SV dried fast, this seemed to make it even faster, lol. So if I want to stamp or tape after using those I'll just wash my hands in between, see how that works. 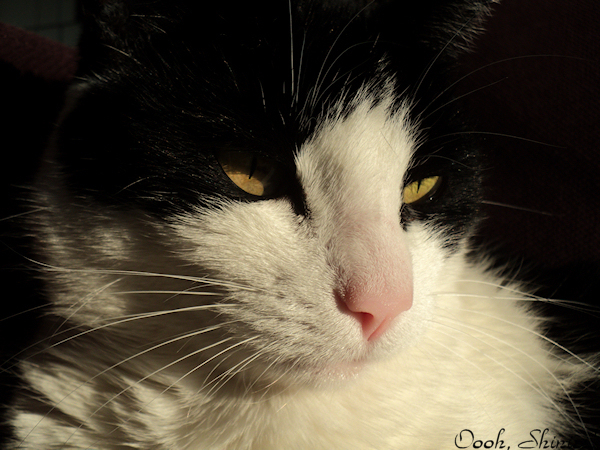 Edit, the sun came through so I took some more pics. As you can see on the 2nd pic, I had some tip wear this morning, it seems that it can be caused by those Express Dry Drops. Good to know those can cause that! 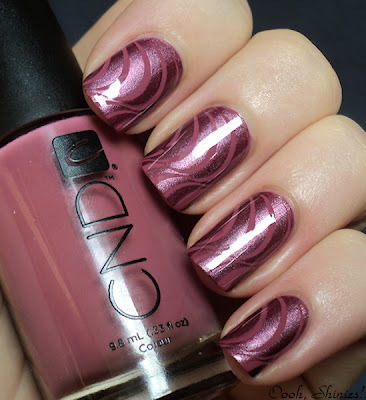 I started with a different mani today, and tested CND Muddy Rose for stamping. 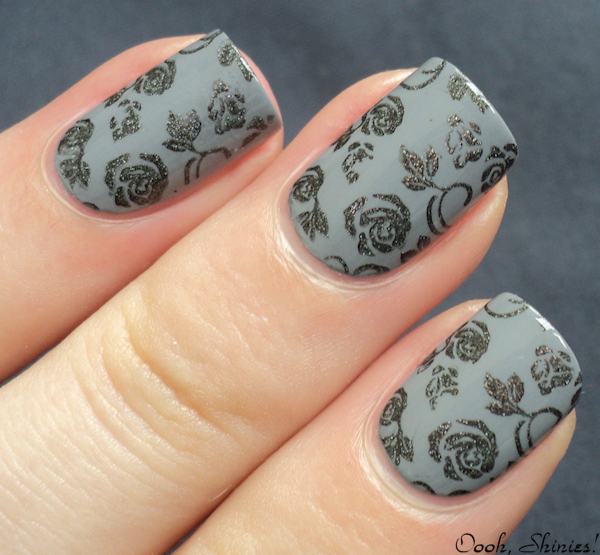 That works, but the combo that I made didn't :P So I went for something else, and used Muddy Rose as base. It turned out as a very quick mani, Muddy Rose is pretty much a 1-coater and China Glaze Joy as stamping polish is dry as soon as it's applied. Enjoy your Sunday and take care! Yep, as the title says, show your nails! I wanted to do some sort of link your blog post, but thanks to the Polish Insomniac I found something that's a lot more fun! I'd love to see one of your favorite manicures, so here you can add yours with a link back to your blog :) Only add nail pics please, and 1 link per person. 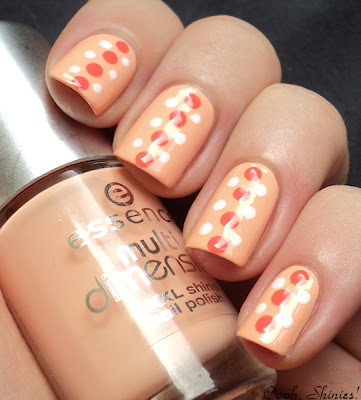 Yesterday I tried out dotting, today I tried out sponging! Or well, I've sponged before, but those were glittery tips, this time I went for a gradient. I've seen manicures like this around and I liked them, so time to try it out for myself! I used a kitchensponge before, but I read that makeup sponges work great as well, so I got me one of those flat, round sponges and cut off a triangle. That worked much better for me! Only next time I'd cut off a bigger piece of sponge, my thumbs got a gradient as well, lol. To hide some flaws I added some stamping. I used 2 coats of Essence Fall For Me, and sponged H&M Blue followed by Essence Forever Mine. 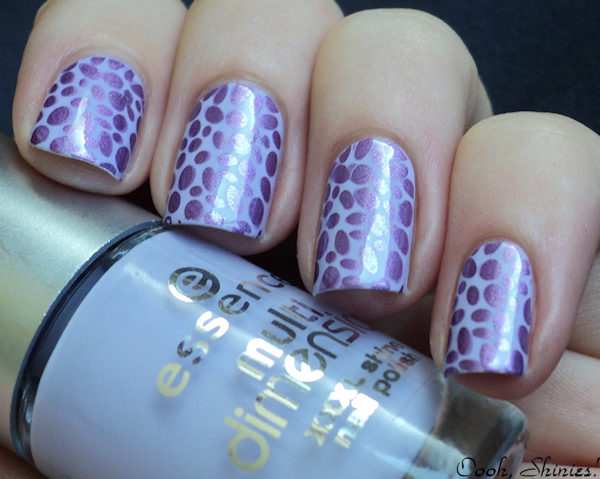 Then I applied Seche Vite to even things out a bit and Essence Express Dry Drops. I stamped with China Glaze Little Drummer Boy and BM plate 223, then another coat of SV to finish it off. The Express Dry Drops I bought because I thought it would be handy for doing taped manicures, but I found it gave a bit of a strange wet, greasy kinda feeling and my stamping got a bit smudged, think those drops might have something to do with it :/ Maybe I should've washed my hands in between, I'll try that some other time, but so far I'll just stick to my beloved SV. Well I can tell you, that wasn't easy :P My left hands looks surprisingly decent, but my right hand was a bit less fortunate, lol. And of course, the more you think "oh please go straight" the worse it gets! 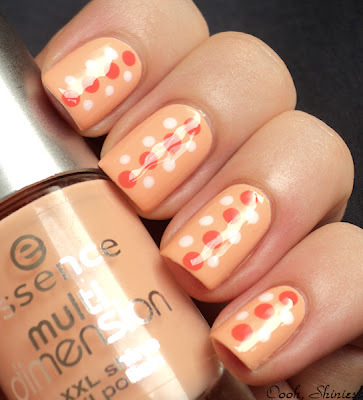 I don't use my dotting tools much at all, mainly because I can be too picky about these kinda things, but I think I'll do a mani like this more often. The result looked so happy! After doing this mani I find ABOP's dotting even more impressive! Next time I'd try smaller dots because I think that I might like that more, although I'm already afraid of the result on my right hand then, haha. 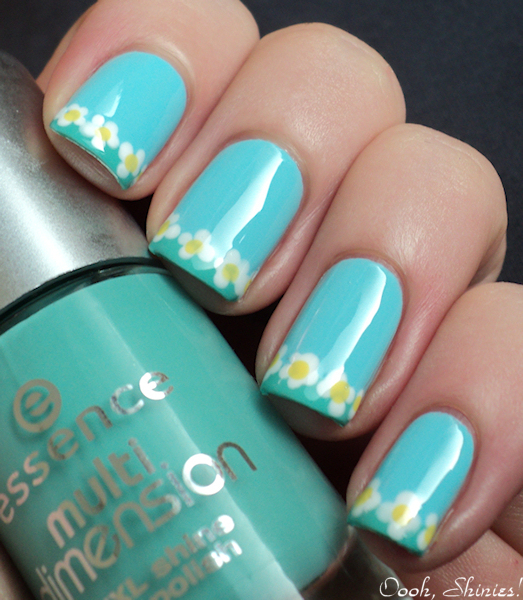 Maybe I should go for some cute little flowers instead, those are easier I think. 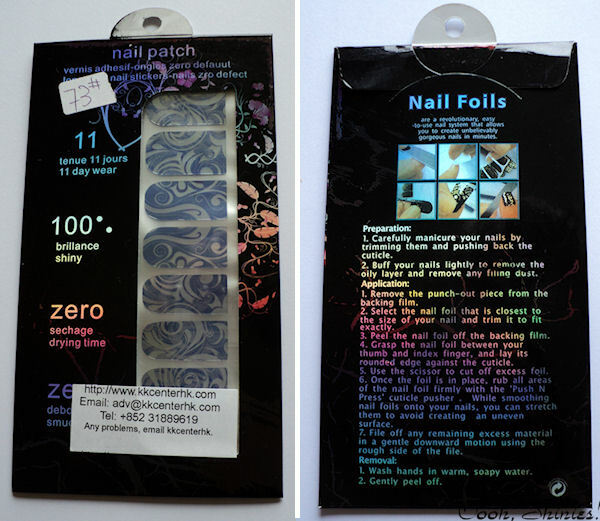 Today I have a review for you of nail foil stickers from KKCenterhk, I got to pick one of their sticker packages and I chose these. So this morning I tried them out and here's how they look! They arrived in a black package with holographic text and drawing on them, pretty! But I have to say though, I'd rather get my products without stickers on them. I'm not sure if they do that with normal purchases as well, and I think it's nice that they add their contact info with the product in case something is wrong, but I'd prefer that on a seperate piece of paper. Besides that, the package looks great, gotta love holo paper! But wait. Let's have a closer look...Are you thinking what I'm thinking? Uhm, yeah. I'm not sure how not washing for 11 days would work out, but I'm sure you'll understand why I didn't test if they really last that long, lol. After moving the package around for a while going Oooh and Ahh I opened it, to find the stickers packed in a plastic cover. There are 16 stickers in different sizes, and they indeed look suitable for toes as well, I had to use the smallest sizes for my fingers. And as you can see here, they're quite long! With good scissor skills I could probably get 2 nails out of 1 sticker. I had to trim just 2 of them (index and pink), the rest had a perfect shape for my nails already. I trimmed them by just cutting off a small strip at the sides, although the index sticker could've used some more trimming for a better fit, but I found that a bit tricky. 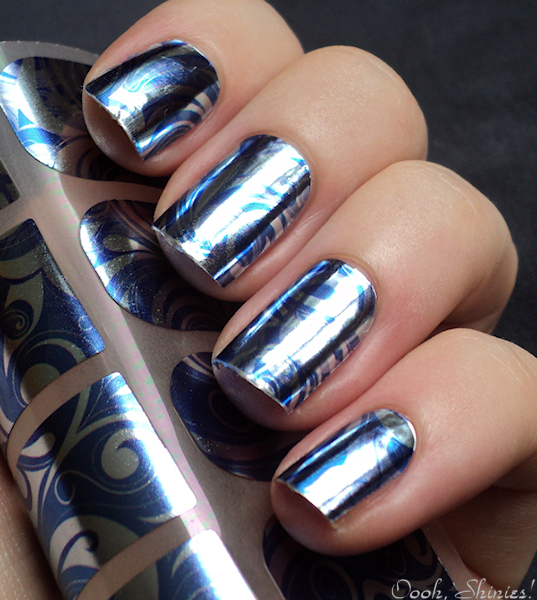 The top of the stickers isn't fully rounded, which my nails pretty much are, but irl that's not so obvious. The application was easy, and as the package already says, you can stretch the stickers a bit when applying them to get a perfect fit. I used the last step of a buffer file to push them all smooth. They didn't need top coat or clean up and are instantly dry of course, which is a plus as well. So I definitely prefer these over water decals. I didn't file the edges fully smooth now though, because I always end up taking a tiny bit off my nails as well then. 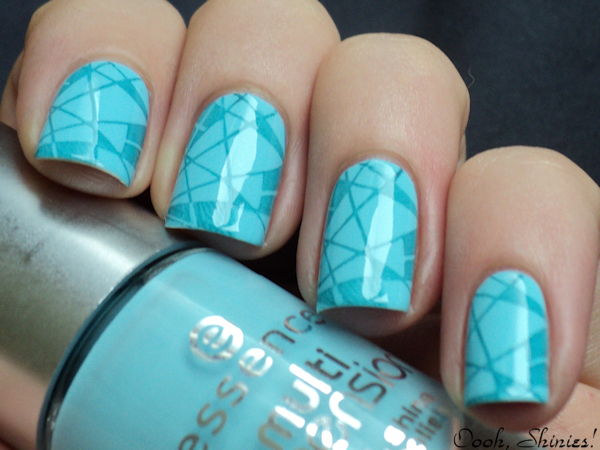 If I'd wear them as full mani, I would of course. After reading about the removal, I wanted to try that out as well. I think they can indeed last for quite a while (if you don't wash, that is ^^), because they were really stuck to my nails and peeling them off without water and soap wasn't working. With warm water and soap they came off pretty easy and my nails look fine after the removal, without any glue remains. All in all I think these can make a fun mani/pedi or accent nail, they have so many different designs and the application is doable for pretty much everyone. You can buy the stickers for $5.20 at KKCenterhk. 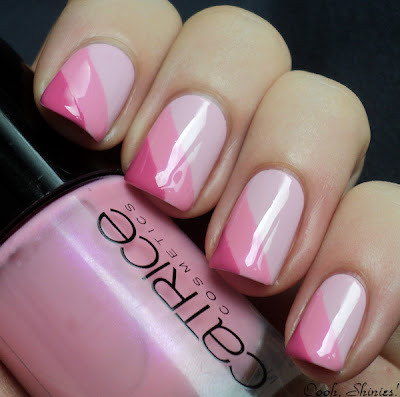 I've decided to join in for the Pink Wednesday fun, so here's my first mani! I went for a taped mani, I haven't done that in a while because I'm often too impatient, but I applied the basecolor yesterday already so it would be completely dry this morning. The pinks are brighter irl, especially the darkest one. Lately my cam seems to find purples easier than pinks, lol, ain't that weird? Hai :) Yesterday I had a bad nail day, ugh, hate when that happens! I ended up with a mani in the end though, but to get there wasn't easy :P And then my pics didn't turn out the way I wanted, booo! I couldn't get the color right. 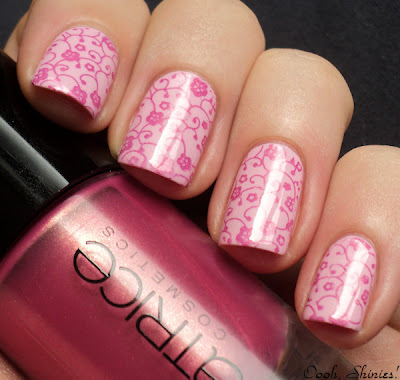 But looking at the result made me forget about all that, it's such a cute mani ♥ Big Spender Wanted! isn't looking so soft irl, and it made the whole mani a lot more vibrant in color. 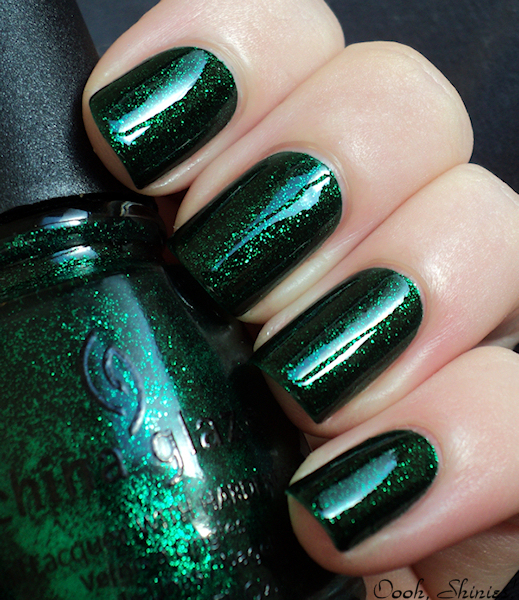 This polish joined my stash a couple of days ago, and I didn't get it before because I wasn't so into greens, but I sure am glad I got it now! It's eye candy! 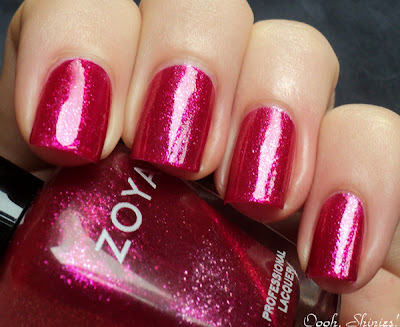 But it's been around for quite some time and I know a lot of you have it, so I don't think I need to say how sparkly and pretty it is =) I used 3 thin coats with top coat. Clicking the pictures for an enlargement shows the glitter better. Hey all! 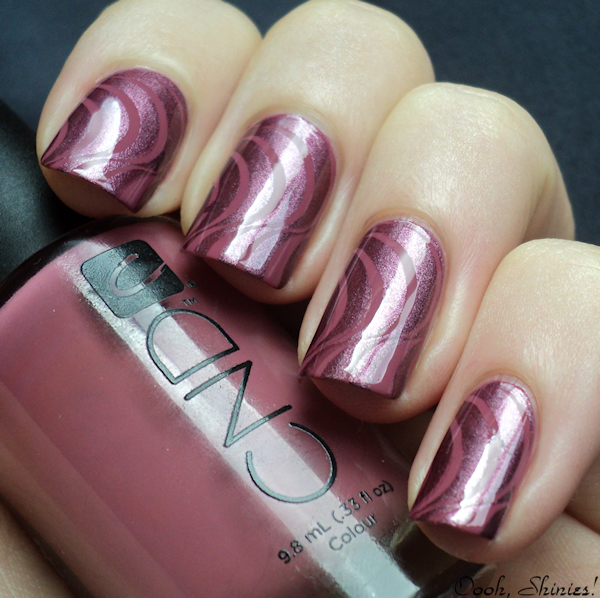 I'm really liking Galahad in stamped manicures, so here's another one. I used 2 coats of Galahad and stamped it with China Glaze Little Drummer Boy and Konad plate m64. I wanted to use another image first, but it was a bit too warm for the fine lines on that one and I kept ending up with partial transfers. Annoying! I'll have to try that one again when it's cooler. I think these 2 colors are a great match, although irl the colors are slightly different. Galahad looks more teal and LDB is looking like the dark blue that it is. My cam just had one of those days, stubborn little thing! Almost weekend, have a good one! I guess that sometimes it'll be obvious which blogger it is, other times it might be more about what comes to my mind when I think of that blogger, like today. 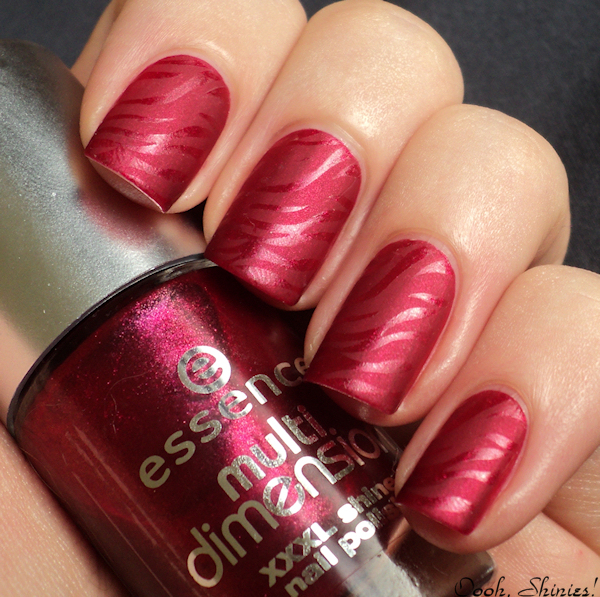 I used 2 coats of Essence Romeo, stamped with Color Club Revvvolution and Konad plate m65. The mani looks a bit darker irl. Can you see why Nihrida came to mind? Then I pick my colors and plate. 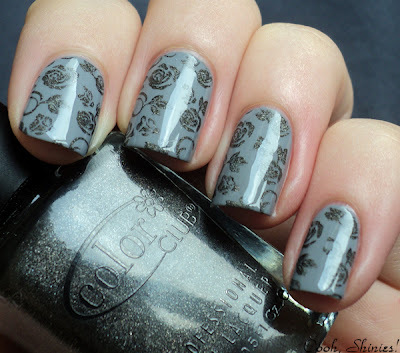 I have my stamping polishes on seperate wheels, so I can easy hold them next to my regular wheels to find a nice match. My plates are in a businesscard folder, as you can see all shapes fit in this one. Today I'm going for the light purple as base and stamp with the darker purple. I start with the usual, basecoat and base color. I do a cleanup after this, some stamping polishes are heavily pigmented and stain like mad (I'm looking at you, Konad black), and I find that it's easier and faster to clean up after that if your base color is already cleaned up. If you want, you can use a layer of top coat on your base color. If you now have a bad image transfer, you can quickly wipe it off with a cotton pad with remover. 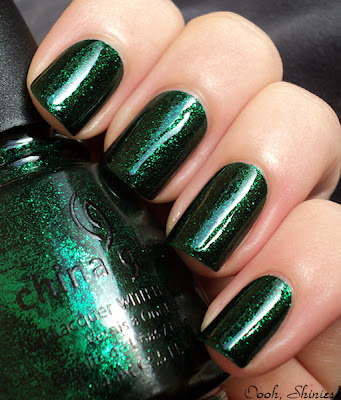 The top coat will be removed as well and your polish won't be shiny anymore, but you won't remove your polish. After you're done stamping you use top coat again anyway to make it all shiny again :) I have a cotton pad with remover ready to go on the side. Stamping time! I use a stripe of polish on the top of the image only, the scraper will fill in the rest of the image and this way you'll waste less polish. I'm not sure why but scraping away from me doesn't work as well for me, scraping towards me really made a difference. So if you have a hard time with it, try scraping in the opposite direction. I hold the scraper at this angle. After scraping the image I roll the stamp over the image on the plate, and have a quick look at the stamp to make sure the image is transferred well, then line it up straight next to my nail. 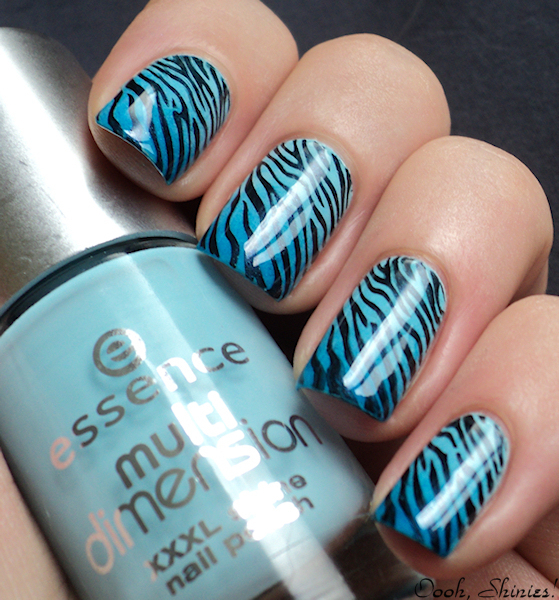 I find it easiest to stamp straight on all nails if I line it up like this. Usually I do several nails up to an entire hand before I clean my stuff. I do wipe off my stamp on my placemat after every nail. If the image isn't transferred well on your stamp, or your plate is all messy with polish, it's time to clean it. Do make sure that your plate and stamper are dry again, else your image will get smudged. I usually dry them off with a cotton pad and then blow some air on them. 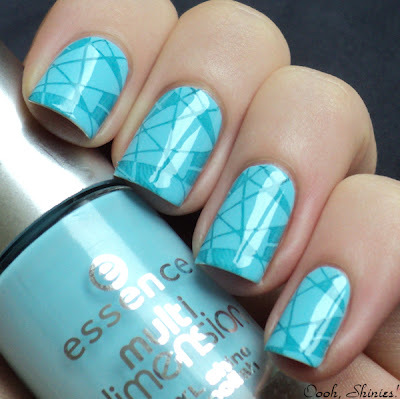 When you're done stamping, you can add rhinestones, some more color with a dotting tool, etc. 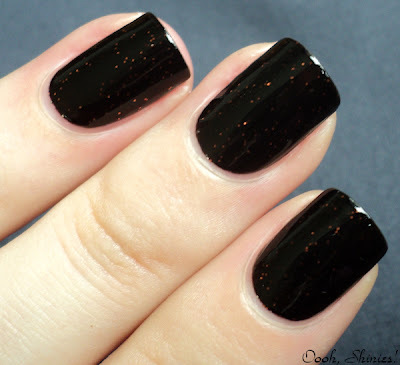 When you want to finish your mani with top coat, polish your top coat floating, as in, don't let the brush hit your nails. Else you'll easily smudge the image. 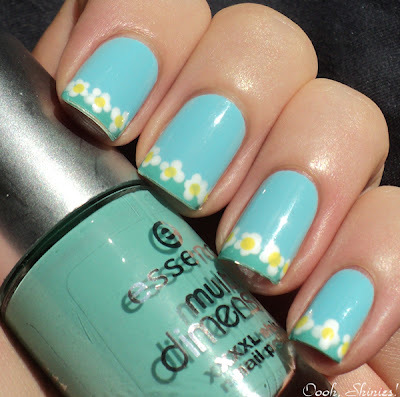 Don't be afraid to use a bit more top coat than you usually do to help you with this. I always use Seche Vite, it's quite thick and works perfect for me. 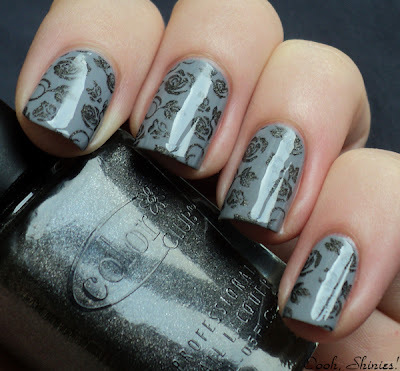 -If you just started with stamping, I'd suggest to go for a more forgiving image (like an animal print or flowers), images with straight lines can be hard to get straight on your nails. 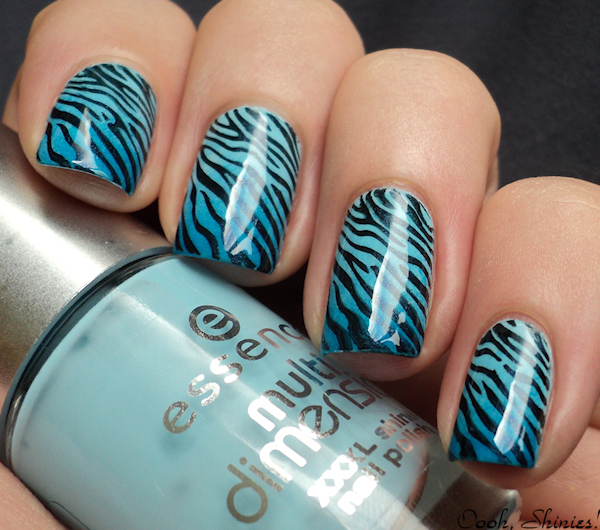 -If you want to practice, you can always do that on an old mani as well, before you take it off. -If your plate is new, it might have plastic foil on it. Sometimes that can be a bit hard to see, but your plate won't work well with it, so make sure to remove it. 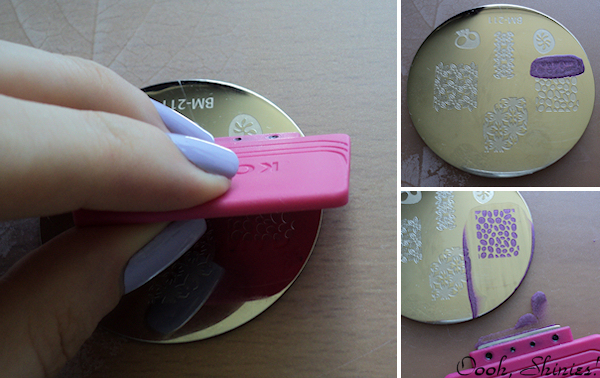 -Give your stamp a gentle filing before you use it for the very first time (you'll only have to do this once). A new stamp is sometimes too smooth to pick up the images well, when the surface is a bit rough, it'll easier pick up the image. 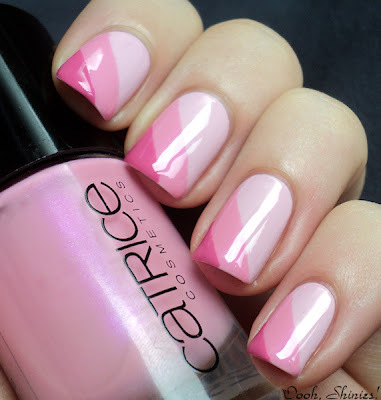 -If you want to mattify your mani, do that after applying normal top coat, else the matte top coat can easily smudge your mani. -You can also stamp an image with several colors or with a gradient. For the latter, use stripes of polish on your image with some space in between them, then use a toothpick to create a gradient between your colors, or just scrape a few times in a row. After that it's the usual scraping and stamping. You can see more about that here. -I use the metal scraper, this does damage my plates a bit, so you can also use things like an old creditcard. I somehow keep failing with cards though (scrape polish out the image, or scrape away too little) so I just go for the metal ones instead. 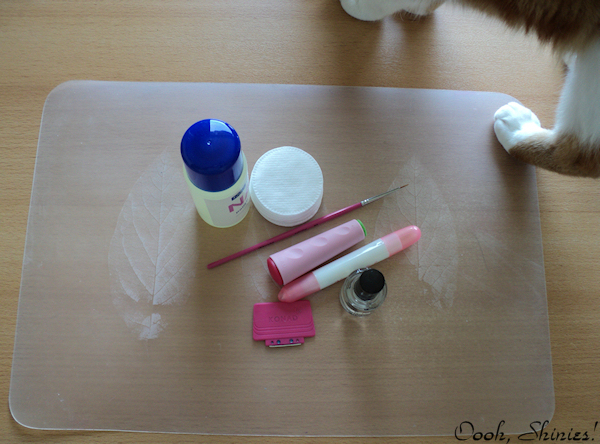 - You can also use a lint roller to clean your stamper in between, all the remains of your image that are on your stamper will stick to the roller and this way you can easily clean your stamper while keeping it dry (originally seen on Wacky Laki). 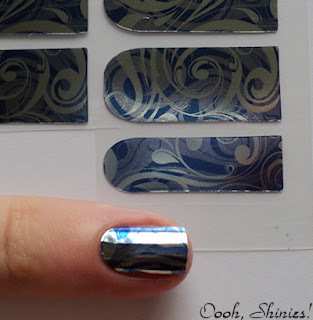 Using normal tape to clean your stamper works too of course! 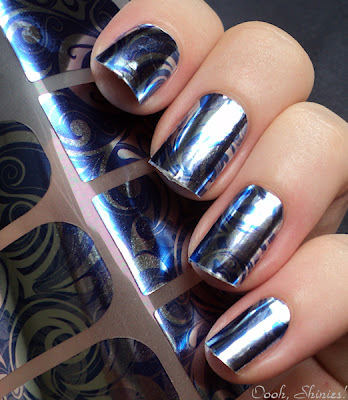 Check out my full nail image size comparison at my Stamping Plate Sizes page! 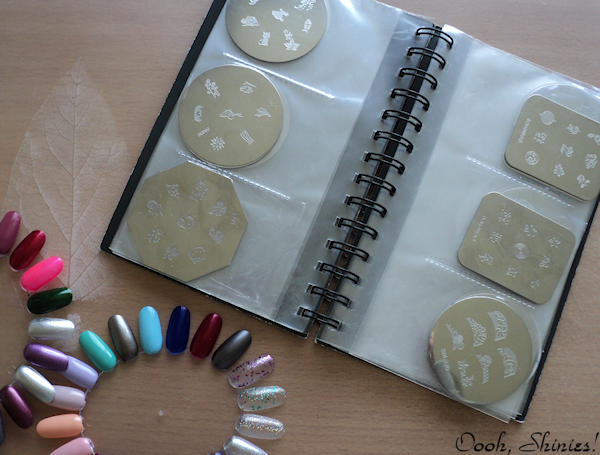 For tips on how I combine polish and images, please have a look at my How To: Mix and match for stamping and my Stamping Polish page. Thanks for looking! 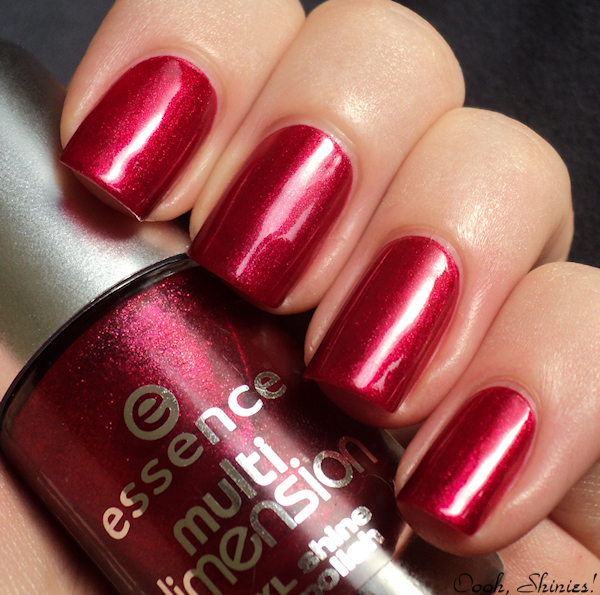 When I went to pick up some more Essence Multi Dimension polishes, I also bought Fall For Me. This blue is an almost dupe for OPI What's With The Cattitude?, and my OPI bottle is half empty so I was happy to find that out :) It also had full coverage in 2 coats and applied smooth, so yeah, nevermind that OPI backup! I tested A England Galahad for stamping and used an image from Konad plate m64. Galahad worked nice, but it's slightly sheer for stamping. You don't see that on the fine lines though, but the bigger areas didn't get fully opaque, those are a bit wobbly. Galahad is more teal irl *mumbles something about grey weather and bad lighting*. 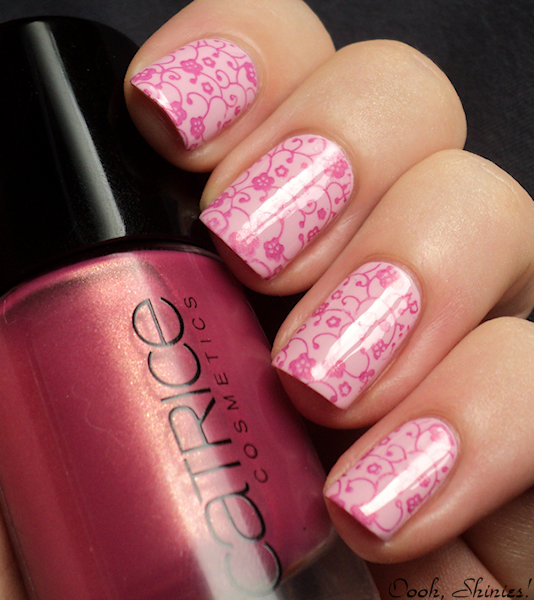 I used 2 coats of Right, Girl, and I have to agree it's a nice color, but I was in the mood for some stamping. 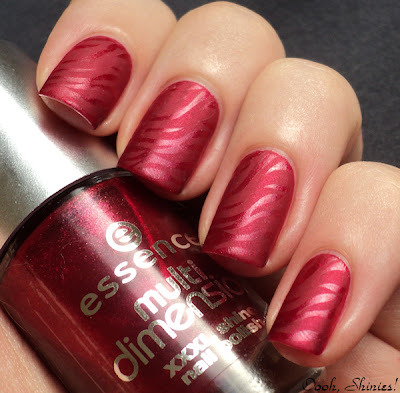 I think that these kind of shimmery reds often don't work so well with stamping, it's quickly too much with anything added, if that makes sense. So instead of picking a stamping color, I mattified the mani with Essie Matte About You, then stamped with Konad plate m69 and Catrice Quick Dry & High Shine top coat. 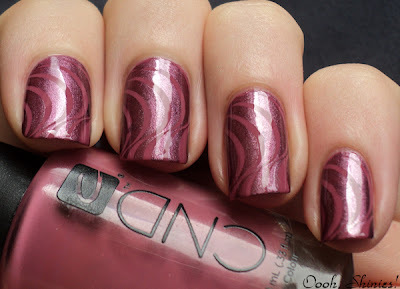 My usual top coat Seche Vite was a bit too quick drying to stamp with, the Catrice worked fine although it's a bit thin, so the stamping isn't as shiny as I'd like.